Destiny Motel is a luxury motel accommodation located in the heart of Palmerston North. We are just a few blocks from the city centre where you will find the business hub, as well as some of the cities best restaurants, cafes, bars and shops for you to choose from. Our boutique Palmerston North motel has everything you need to make your stay a pleasure, with a range of spacious studio, one bedroom and two bedroom suites with 50” HDTV, Sky, free high speed Wi-Fi, beautiful bespoke furniture and in-room kitchen facilities. Inquire about our current special for your next stay at Destiny Motel. Relax in your beautifully furnished, well appointed room. The newly refurbished suites have been designed with intrigue, colour and attention to comfort and quality. We look forward to welcoming you to Palmerston North's most recently refurbished motel. For the last word in luxury Palmerston North accommodation, and an experience that is truly a home away from home, choose Destiny Motel, located a short walk from The Square in the central city. Whether it's for business travel, or a weekend treat in the heart of the Manawatu, our suites offer the best in luxury Palmerston North accommodation. The city's business hub, best cafes, restaurants and shopping are almost on the doorstep. Please call +64 6 355 0050 to discuss your personal requirements. Owner, Brent Haami, looks forward to welcoming you to Destiny on Fitzherbert where attention to fine detail will ensure your stay is the ultimate experience in the best of accommodation on offer in Palmerston North. 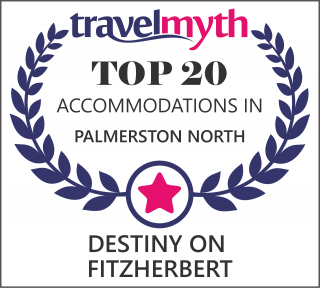 Destiny on Fitzherbert motel is the perfect Palmerston North motel from which to head into town for meetings or shopping, explore the beautiful rose gardens, the Manawatu's bridle track walkway, and our famed Rugby Museum, as well as lots more to discover. Thank you wonderful stay. "Extremely clean", service marvellous, and love the decor! We recently stayed at Destiny Motel in Palmerston North for a few days for a family get together recently. We rented three units. All three were well presented, extremely clean and well equipped. The Manager and his staff were very friendly and willing to help and went out of their way to make our stay enjoyable. I would definitely stay here again when next in Palmerston North. Without doubt the nicest and most hospitable Palmerston North accommodation I have stayed at. Well done guys.